Tony wrote this article about stealth camping during a 2015 bicycle tour. 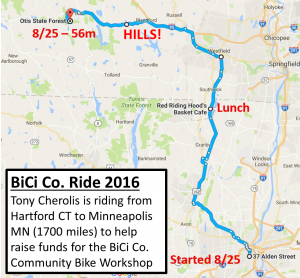 We are revisiting these recommendations now, as Tony heads off on his 1,700 mile trip from Hartford to Minneapolis, MN to promote the 2016 BiCi Co. fundraiser and membership campaign. 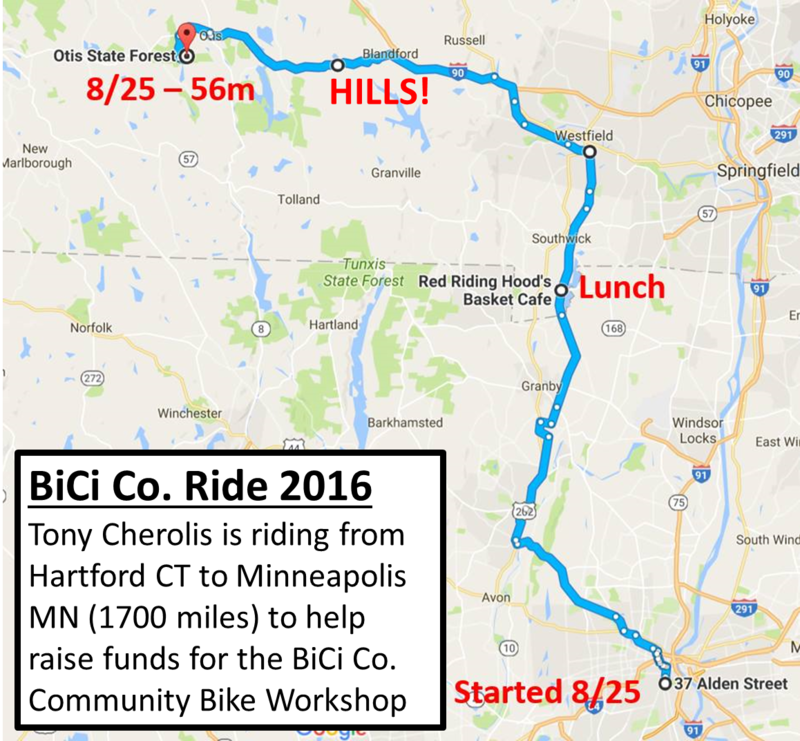 Tony just completed his first day on the road – and his first stealth camp of the trip in Otis State Forest. Wishing him well! I get incredulous looks from folks when they hear about my typical bike touring accommodations. Certainly, one could stay at hotels, or line up a string of friends and WarmShowers hosts. Even state parks with ready electrical outlets and community bathrooms are upper tier lodging when I’m traveling. I appreciate the luxury of a bed, air conditioning, a door that locks, and the all important shower. Having access to a washing machine to wash away the road and start fresh is a gem. View from Otis State Forest stealth camp. Pretty darn nice. Not another soul in the park. What I’d like to share is that the value of these luxuries is amplified when you stealth camp. I often say, “You can’t be happy until you’ve been sad.” That’s my logic. Those swaddled in silk pajamas, pillow top mattresses, and climate control don’t truly appreciate those amenities. When I get to a quiet, secure, and comfortable bed – it’s Heaven. Sleeping on clouds for a week at least. If I forget I’m in Heaven, I can think back on the road and it’s Heaven again. That’s not the only reason. You think through reasons and details during a long tour. The next reason to stealth camp is minimizing overhead. If you’re going to take off work for 6-7 weeks for a bike tour, and you’re not disgustingly wealthy, the cost of the trip is of import. Even a state park will run you $15 – $25 a night. If you camp in a “dispersed fashion” at (or near) a state park, but then catch a shower on the way out in the morning, you just saved as much as food is going to cost for that day – doubling your range if financially limited. WarmShowers is also a good financial option, since hosts will often feed you dinner and maybe even breakfast, but it’s difficult to line up a host for every evening. A tour that combines WS hosts and stealth camping can be had on a shoestring budget. Far off the beaten path in pursuit of what looked like a pond. Photo credit Meghan Tarkington. The last value of the stealth camp is the isolation and novelty. I’ve had some of the most amazing and private camping spots on this past trip. When you can stand around and air dry for 30 minutes in the sun after jumping in a pond – that’s a freedom not many experience. Try that in a State Park and you’ll have a different type of lodging for the evening. Trust your gut feeling. If a camp feels sketchy or not right, don’t stay there. Start looking early. Well before you need to camp, keep an eye out for good looking parks and wooded parcels. Be prepared for rain. My first long tour was with a hammock that didn’t have a rain fly, and that significantly cut down my camping options. Hammock camping can be super light, but you should get one with a fly. Plan your water supply. You’ll need enough water to get to camp, for in camp use, and then enough to get to your next refill. I’ve been carrying 3 large bottles late in the day, and I have a filter bottle for backup if I need to pull from a lake or stream. When you’re riding during the day you may only need two bottles full. Bring toilet paper. A bit more than you need for two days. Stealth camps nay not have a bathroom. Be a good camper – bury your waste. If you know (or intuit) that the park or trail is going to get busy in the morning, get up early and move on. Keep an eye out for free or locally accepted informal camp spots. These often occur along popular through riding bike paths. For example, the C&O Canal has a primitive camp site every five miles along it’s length with well head, a grill, and a port-a-john. Have a helmet light or headlamp. Stealth camp setup often happens at dusk or even at dark if you’re running late. An advanced technique is to scout a trail, catch a late snack, and just at dusk duck into the trail and set up camp after the last folks are likely to wander by. Also after park staff has left for the night and potentially closed the park gates. A headlamp makes this much easier in the dark. Bring a pair of comfortable (test them / acclimate at home) earplugs. Your spot may look great, but be fifty feet from the train tracks or US interstate. Learn what poison ivy and similar itch inducing plants look like. It’s a good idea to learn about stinging nettles too – although that is just a temporary skin fire. My physiology is particularly well suited for stealth camping. I don’t get poison ivy and no bumps from mosquito bites. That’s why I forgot it in my first list of important things. I’ve heard there is nothing worse than squatting to go to the bathroom in poison ivy and finding your nether bits covered in oozing, itchy patches for weeks. Funny (not funny) story about my youth. My brother, David, gets severe poison ivy. I found it hilarious to pluck a section of vine and chase him around with it. He’d get an itchy tattoo for weeks wherever I was able to swipe him with it. I was a horrible child. A roof to keep the dew off. Photo credit Meghan Tarkington. Do not camp among the boulders near the base of a tall cliff. Those boulders got there by falling off the cliff and tumbling along. In the middle of the night, you have a remote, but entirely avoidable, chance of getting smashed by falling rocks. 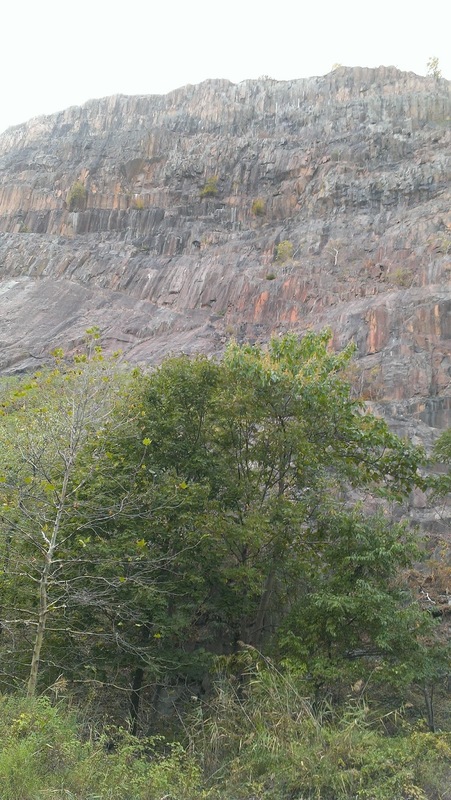 A frightening night listening to rocks cleave off a too close cliff in the Hudson River Valley helped create this rule. Camp below the high water level on a river, creek, or beach. Be a bit conservative here. A tidal river can quite sneakily rise overnight and all the sudden you’re sopping wet and your gear has floated away. Keep food in your tent. Unless you want to intimately meet a raccoon or bear, put your food far from your camp. I keep it double bagged in my touring dry sacks. When bears are a concern, the food gets hoisted into the air on a tree branch a good way from the tent. Do not start a forest fire. If you don’t know how to contain a fire, put it out all the way, or ascertain if the conditions are just too risk – do not start a camp fire. Be careful with your camp stove. Another reason to think twice about your camp fire is that it is an obvious camp giveaway and locating beacon if you are trying to keep a low profile. Pick a swampy spot. You’ll get eaten alive. Leave your bike unlocked while you take a hike or sleep. I just sleep better, and this one time a drunk Quaker on the Earlham Campus green tried to steal my bike while I was sleeping right next to it on the ground. I always carry at least a lightweight cable lock, and the amount of effort to lock up and unlock is negligible. Camp 20 feet into a well used trail, unless you’re okay with every damn dog walker strolling by at 6am. Go in at least half a mile. That weeds out all but the most ardent walkers. Try to do this in a big city. Camping under a bridge in a city with a lot of valuable gear and a transient population is a great way to get robbed. 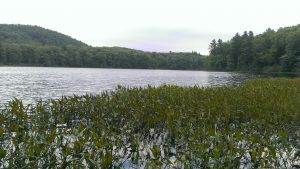 I’ve camped several areas in Hartford, but that requires a lot of knowledge of the area. Not something you’re going to have passing through on a tour. Expect to get the perfect spot every night. Some nights you might totally strike out and have to go to a “backup”. Getting a great view is a challenge for stealth camping, because a view means that you’re potentially visible too. Neglect to dry out your gear. This is a camping basic, but on this trip I’ve had to take extra steps to keep things from getting musty. With stealth camping you sometimes have to get up early and pack up wet. The dry out may be at the end of the day, rather than the beginning. Freak out about every noise you hear during the night. There are animals in the woods. Toads hopping in the leaves certainly sound like a person sneaking up on you when your lizard brain is engaged. Cliffs are pretty, but don’t camp too close. Falling rocks happen. There are backups. Camping behind a church is usually okay, but be up and gone by services. You can often get a spot behind (or even inside) a fire department if you stop and ask. 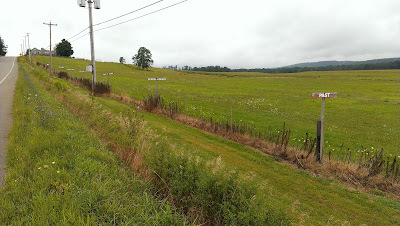 When you are super rural, and it’s nothing but farm fields, pick out a farm house that looks well kept and you can ask if sleeping in their back yard or field would be OK.
What if someone comes knocking? It happens. Be courteous and apologetic. Explain what you’re doing. If it’s the park ranger, you’ll probably have to pay the camping fee. Maybe sing an aria. Meghan, the opera singer, actually did this on her first night ever stealth camping. I prefer to be a likable, harmless story teller. I’ve not yet had to “move on” in the middle of the night. But it’s not the worst thing that can happen. Happy camping! 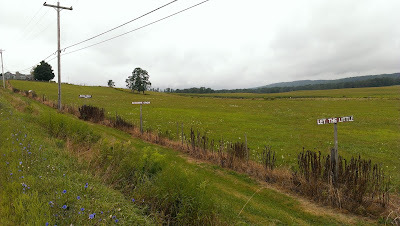 And remember —– the following rural roadside advertisement was the cutest thing ever.